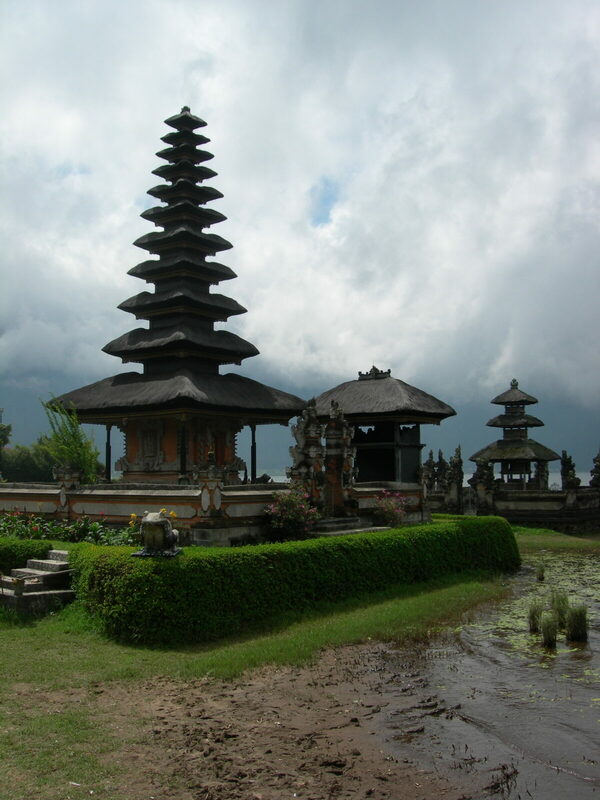 Approximately three million people live on Bali and about 90 percent of the people follow the Hindu religion. Balinese Hinduism was formed from a combination of existing local beliefs and Hindu influences from across Southeast Asia and South Asia. The Balinese, like all people of Hindu faith, believe their religion is one of holy water. Water symbolizes fullness. Water is the building block of life and all living beings are at the mercy of God for water. The Balinese consider everything to be holy and they believe that physical and spiritual lives are indivisible. Balinese describe their attitude toward life as one with “happiness in duty.” Faith and fun are one. Festivals, ceremonies, dances, and trances are an integral part of Balinese life. The local people make offerings to the gods every day. Typically, women prepare and deliver the offerings on behalf of their family. Most offerings are simple and include rice, flowers, and incense on a banana leaf. For special ceremonies, the offerings are much more elaborate. The Balinese believe that when a child is born, it must not touch the ground during its first 105 days. During that time, they believe the baby is still living between heaven and earth and is not yet human. After three months, the family holds a ceremony to welcome the child to the material world and to give the child its name. From this point forward, the child can touch the earth. Like all followers of the Hindu religion, the Balinese believe in reincarnation. Therefore, the lifelong goal of every Balinese person is to have a beautiful cremation ceremony. They believe the spirit is not released until the body is destroyed and the ashes are thrown to the sea. When a Balinese person dies, a surviving son must arrange for a cremation ceremony. Therefore, it’s important for every Balinese family to have at least one son. Wealthier families have private cremation ceremonies fairly soon after a relative’s death. Families that don’t have the financial resources immediately available for the cremation may temporarily bury the body for up to 25 years, while they save enough money for the cremation ceremony. They also may join with other families recently who have lost a loved one. By joining together, they can conduct a mass cremation ceremony to make it more affordable. The Balinese can’t cry when a relative passes away. If a tear falls to the earth, it grounds the spirit of the deceased, which prevents the spirit from leaving this world. Like all followers of the Hindu religion, the Balinese follow the caste system. There are four classes of people and the priests are at the top of the system. Weddings between castes are allowed, but sometimes frowned upon. The bride always assumes the caste of the husband (up or down) and can’t return to her family’s caste if the marriage fails. The Balinese also believe that their canine teeth attract evil spirits and bad human qualities, such as greed and jealousy. They historically believed that these teeth must be filed and flattened in order to be reincarnated. In the past, when children became adults, the village priest filed their canine teeth down to a uniform length. Although the Balinese have stopped this practice for humane reasons, they still conduct a symbolic filing on young adults that is brief and less intrusive. The Balinese wear yellow or white clothing when entering a temple for a ceremony. Musicians, however, are exempt from this dress code and they usually wear very bright clothing.